Forced by poverty and sickness, a woman stabbed and wounded her two minor daughters and later tried in vain to commit suicide by partially slitting her throat open early this morning in this village about 12 km from here. 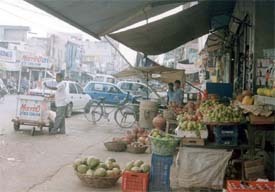 In the wake of traffic on city roads being in a state of utter disorder, coupled with slack enforcement and regulation of traffic rules, the street vendors, including the rehri and farriwalas, are virtually holding the people to ransom. Four teams of officials of Panjab University, Chandigarh, today visited all its affiliated colleges in the city to investigate the alleged misuse of duplicate stamps bearing signatures of Controller of Examinations of the University. Three directors and a general managers of Vikas House Building Company, which is developing South City colony here, have been booked by the city police for cheating and defrauding a former director of the Department of Industries. Taking an action in the alleged custodial death case of a snake-charmer during interrogation by the CIA staff in connection with a robbery case, the district police has opened an inquiry and directed a DSP of the CIA to file a reply to the charges within three days. 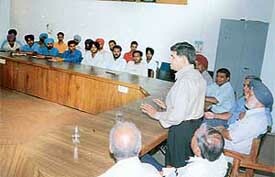 A meeting to assign duties for mobilising people and carrying out arrangements to observe the 8th death anniversary of former Chief Minister Beant Singh at Payal on August 31 was held here today. A large number of Congress workers attended the meeting. As a tribute to Giani Bhagat Singh, former president of Ramgarhia Educational Council, an “Akhand Path” was held at Ramgarhia Educational Complex this morning on behalf of various educational institutions being run by the council. The Bhartiya Valmiki Dharam Samaj (BVDS) took out a scooter and motor cycle rally in the city localities here today to further its campaign against social evils and spread the message of brotherhood and amity, as preached by Rishi Valmiki. The President, Mr A.P.J. Abdul Kalam, will address members of the Ludhiana Management Association (LMA) during his maiden visit to the city on September 4. A Bihari migrant, Mullan, who lived in Mohalla Shakti Nagar here, was arrested yesterday by the Jodhewal police and booked under Sections 20,61 and 85 of the NDPS Act. The police has seized 2.5 kg of cannabis from his possession. The Prime Minister, Mr Atal Bihari Vajpayee, has assured a delegation of the Chamber of Industrial and Commercial Undertakings (CICU) that he will look into the issue of the rising steel prices in the country. He is learnt to have expressed concern over the rising prices and said he would take immediate remedial measures to provide protection and relief to the industry. The State Bank of India has achieved a milestone by fully computerising all its branches in Punjab. This was declared by Mr Yogesh Agarwal, Chief General Manager of the Chandigarh circle of the bank, while inaugurating a fully computerised branch in Punjab at Mundian Kalan. 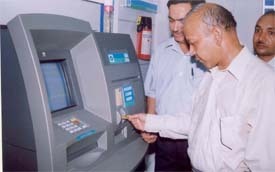 Mr Yogesh Aggarwal, Chief General Manager of the State Bank of India, Chandigarh circle, inaugurates an automated teller machine (ATM) in Ludhiana on Saturday. 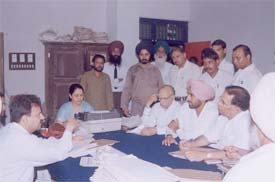 Dr Bant Singh Kooner and Dr R.S. Mann, senior entomologists of the pulses section of PAU, have cautioned farmers against the attack of hairy caterpillar and semi-looper in moong and mash crops during monsoon season. A 20-days training programme for rural artisans on manufacturing of improved agricultural implements, organised by the Department of Farm, Power and Machinery, College of Agricultural Engineering, Punjab Agricultural University, concluded here today. The Senior Humanities Forum of Kundan Vidya Mandir, Civil Lines, organised an inter-house talent hunt contest here today. 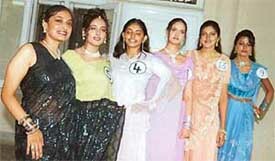 Each of the six houses was allotted 30 to 40 minutes for presenting solo ghazal, solo pop number, duet song , instrumental music, classical music, classical dance, western dance, mono-acting, and compering. The campus of the Guru Nanak Institute of Management and Technology (GNIMT), Gujarkhan Campus, Model Town, dazzled with colour and festivity amid Freshers’ Day celebrations here today. As many as 141 of the 337 cases involving Rs 63.57 lakh were settled in the quarterly Lok Adalat organised by the District Legal Services Authority here today. The authority constituted 16 Benches for the disposal of cases. The Chief Judicial Magistrate, Mr Arunvir Vashisht, hears cases at a Lok Adalat in Ludhiana on Saturday. A fast track court has sentenced Soni, alias Sonu, Kuki, Dinesh, alias Dara, and Vicky, all residents of Chowni Mohalla, to seven years rigorous imprisonment each in an attempt to murder case. The court has also imposed a fine of Rs 1,000 each on the accused. A five-member delegation of the PCMS Association led by state president Dr Hardeep Singh presented the case of the doctors for restoring their NPA before a high-power committee constituted by the government at Punjab Bhavan, Chandigarh. The committee assured them that until a final decision on NPA is reached, the doctors will get pay for this month without deducting the allowance. 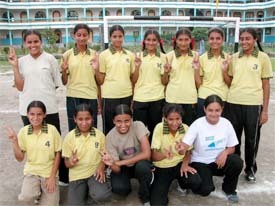 Girls of Guru Hargobind Senior Secondary School, Sidhwan Khurd, faced little challenge from GPS School, Gobindgarh, whom they defeated, 8-2, to win the title in the Ludhiana District Sahodaya Schools Handball Championship at GMT Senior Secondary School, GT Road, here today.